One of the most common questions we’re asked is, “What’s the difference between Dunlop and Talalay?” We’ve described the technical differences here and here, so I’d like to take a shot at a more subjective view. It may help you understand natural latex better while you’re waiting for your samples to come in the mail. The Dunlop manufacturing process has been done the same way since 1929. The latex mixture is poured into a mold and baked. Natural sediments in the mixture settle to the bottom and are baked in, so each layer is subtly denser, therefore a bit firmer, on the bottom side. Dunlop is very versatile in our adaptable mattress design. Say, for example, you hurt your back years from now, and need a much firmer mattress for six months to recuperate. Simply unzip the casing top and turn over any layer of Dunlop for a slightly firmer feel. Try one such change for a week, then if you’d like it firmer still, turn over another layer. Even all three. You’ll notice the difference. You can also move a firmer layer from the bottom to the middle or top if you like. 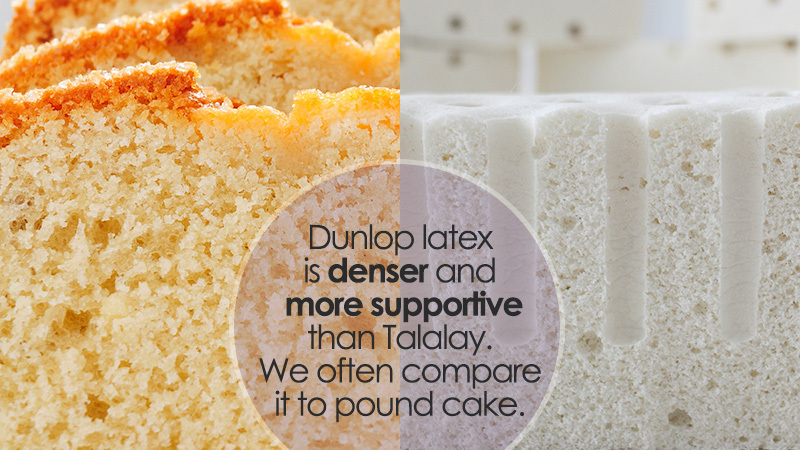 The texture of Dunlop latex is quite close to pound cake. It has a denser feel than Talalay does. Dunlop is resilient and responsive to your body, but not bouncy. When people say, “I really like the top to be soft, but I don’t want a ‘sinking’ sensation,” we usually suggest Soft Dunlop. Using Medium or Firm Dunlop in layers below the surface will give excellent stability for the spine. Talalay (pron. TAL-ah-lay) latex, on the other hand, is softer than Dunlop. Soft, Medium, and Firm Talalay are softer than their Dunlop counterparts. 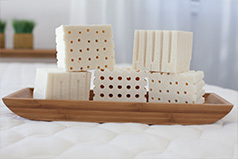 The Talalay process adds two steps that are not used in Dunlop manufacture—after the mold is poured, it’s sealed, and the process is completed in a vacuum environment. And the Talalay molds are flash-frozen before they’re baked. The vacuum and freezing steps create a very even consistency. 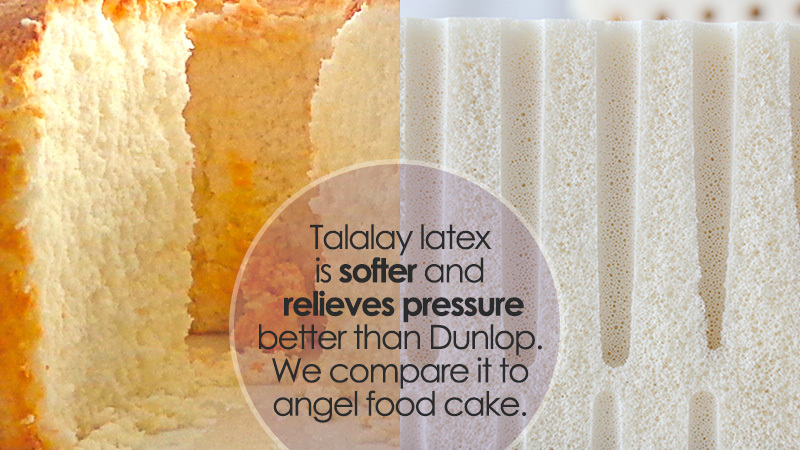 Soft Talalay is very like the texture of angel food cake. (Angel food cake that lasts for decades, that is.) You won’t sink like a stone lying on Talalay, but it does yield more around your body than Dunlop latex does. Another characteristic of Talalay is a “springier” feel. For big people who weigh 200 pounds or more, we don’t normally suggest the softest Talalay, but for those who love a pillowy, cushy surface that feels a little “embracing", Talalay’s the charm. Sometimes people tell us that although they’re eager to get rid of a memory foam mattress because of the pungent chemical smell, they did love the surface feel. Soft Talalay will give you the closest approximation to the “cradling” sensation of memory foam. But better, since you don’t have to re-heat it to get it to feel good again every time you roll over! The reason Talalay is more expensive than Dunlop is not because it’s “better” or “purer”, but simply because the cost of those two extra manufacturing steps—the vacuum chamber and the flash-freezing—is passed along. When you choose layers for your Savvy Rest, open-mindedness is the best approach. Visit a Savvy Rest dealer and try different combinations, or if there’s no dealer nearby, give us a call. We’ve had a lot of practice using a series of targeted questions and we can help you choose. The main thing to remember is there isn’t a right or wrong type of latex, just the type and combination that will feel best to you. Your height, weight, sleeping positions, degree of restlessness, any pain issues—all those factor into your choice. It’s a collaboration, and an art rather than a science, but we can normally guide you right to the customization you’ll love for comfort and support. And if the first choice isn’t perfect, you still have three months to order a latex exchange (about 10 percent of our customers do). No matter which type you choose, you’ll find that natural latex will comfort and support you, for the sleep you’ve been dreaming of….